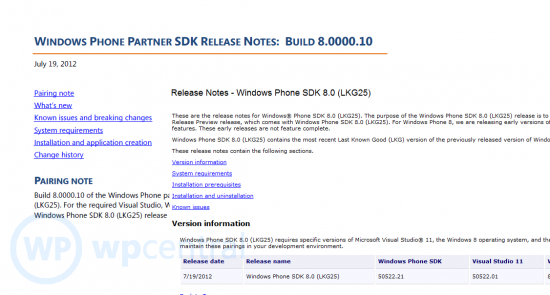 Microsoft releasing Windows Phone 8 SDK on September 7th? Although the Windows Phone 8 software development kit (SDK) was leaked a few weeks ago, allowing us to go through it like drug-starved loonies, the big question on everyone's mind is When will Microsoft actually release the package to developers? As one can imagine, SDKs do take quite a lot of work to put together. There are APIs to lockdown, questions and answers to be formulated and it all needs to be written up so that developers will have an easy ‘cookbook’ for making apps. In that regard, we can see why it would take the Windows Phone Team some time to put one together. We now think we may have a date for that release: at or around September 7th The date comes by way of inference not a tip or documentation. And like all inferences there are certainly no guarantees. What’s odd about that is when you peruse the rest of the sessions for everything else—from Azure to Windows 8 to Lync 2013—all have session details already in full. In fact, out of the 150 sessions for TechEd Australia, it is only Windows Phone that has an embargo on session details for September 7th. The only reason we can think of (and the Windows Phone insider who tipped us) is because those sessions deal with the Windows Phone 8 SDK. After all, TechEd is developer and IT conference so the only thing for them to discuss is the SDK (and they aren’t talking Windows Phone 7.5 that late in September). While that’s great news for those devs itching to get their hands on the Windows Phone 8 SDK, it does not give them too much time to start coding apps before the first phones are expected to hit shelves—in fact, at present estimates, that’s less than 60 days for them to start to get new apps. That should leave little doubt that Microsoft has a very tight time schedule that they are trying to meet for this massive OS release. Let’s hope it doesn’t disappoint. Update: As an odd coincidence, @EShy reminds us that Nokia has something "amazing" planned for September 7th too. Certainly intriguing though we're not sure of the exact connection. We just know that September and October will be very busy for our writers.